A mum who witnessed a brutal execution outside her home said her daughter was playing in the street just minutes before. Police and paramedics were called to Cornwood Close in Belle Vale at around 11:30 am this morning after a man was shot multiple times in the head and torso. 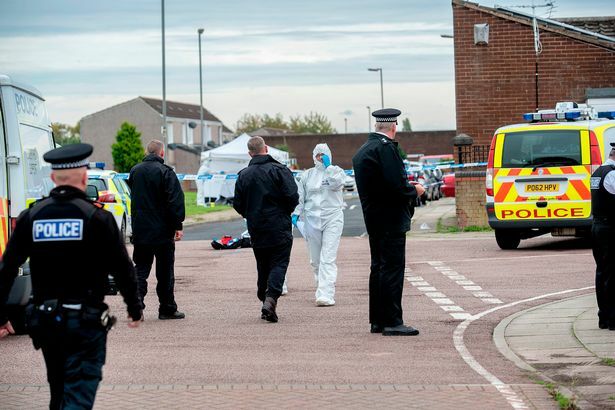 The 27-year-old victim died a short time later and a murder investigation was launched as police hunt an armed assassin who is believed to have fled the scene on a bicycle. One neighbour, who witnessed the shocking incident this morning, told the ECHO (Liverpool News) it is her daughter's birthday today and she had been playing with her new bike just before the shooting took place. The woman, who didn't want to be identified, said: "My daughter was out in the street I wouldn't even say two minutes before it happened." She added: "We ran inside and I ran upstairs to look out the window but he was gone." "It must have all happened in seconds. I was screaming and my boyfriend ran over and was trying to help him." Neighbours and nearby residents have spoken of their shock at the incident with the same woman describing it as 'disgusting'. She said: "It's horrendous, disgusting, devastating and heartbreaking." "The knife and gun crime these days- it's sickening"
"It's worrying as a mum with kids. My lad is 16 next week and I feel like just leaving, but where do you go? Everywhere is the same." "I've been crying all day. It's really really knocked me sick. I didn't know the guy but I knew his mum and dad to say hello to." "His mum is on holiday. It's just awful. She's coming home tonight." "I didn't see the guys body I just saw his face in the balaclava it just all happened so quickly. Literally seconds and then he was gone." Police are still at the scene as forensic officers carry out their enquiries in the area. Detective Chief Superintendent Natalie Perischine said: "The investigation into this shocking incident is in its very early stages, and we are keen to speak to anyone who may have information which could help us establish the full circumstances and find those who are responsible." "I want to reassure the public that gun crime will not be tolerated on the streets of Merseyside at any time of day and that we will thoroughly investigate any information given to us so we can put anyone who carries guns on our streets behind bars." WHAT DO YOU THINK OF THIS? LET US KNOW IN THE comments! I wasn't too far from here on Sunday morning. Heard loads of sirens across the city and wondered what had happened.